To bring forth the fascinating colourful tones of an oratorical, homogeneous instrument affords great joy. To feel how an instrument brings forth all the nuances and facets with ease, is an experience. 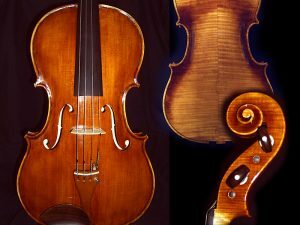 We allow the repair and restoration of old and valuable instruments to inspire us and with an exchange of ideas, wishes and perception with the musician, let it flow into our master instruments. The viola has a body length of 42.5 cm and a correspondingly voluminous, dark tone. It is easy to play thanks to short scoring, harmonizes in the quartet and can also be performed soloistically. The sound is very modulatable.